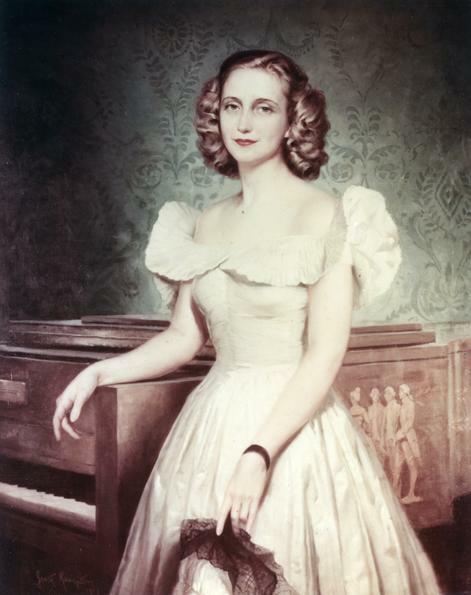 She was born in Independence Missouri and christened Mary Margaret Truman (for her aunt Mary Jane Truman and her maternal grandmother Margaret Gates Wallace) and she was called “Margaret” from early childhood. Margaret graduated from George Washington University and in the late 1940’s she under went operatic vocal training and pursued a singing career that was widely publicized during her father’s Presidency. She performed on stage, radio and television until the mid-1950’s…. On April 21, 1956 Margaret married New York Times reporter (and later editor) Clifton Daniel (1912-2000). They had four sons Clifton Truman, William Wallace, Harrison Gates and Thomas Washington. In later life Truman resided in her Park Avenue home in Manhattan and served on the Board of Directors for the Harry S. Truman Presidential Library and Museum along with Board of Governors for the Franklin and Eleanor Roosevelt Institute. Margaret Truman Daniel died in Chicago on January 29, 2008 at the age of 83. Her ashes and those of her husband E. Clifton Daniel were interred in her parents’ burial plot at the Truman Library and Museum in Independence Missouri…. You are currently browsing the archives for the Presidents category.